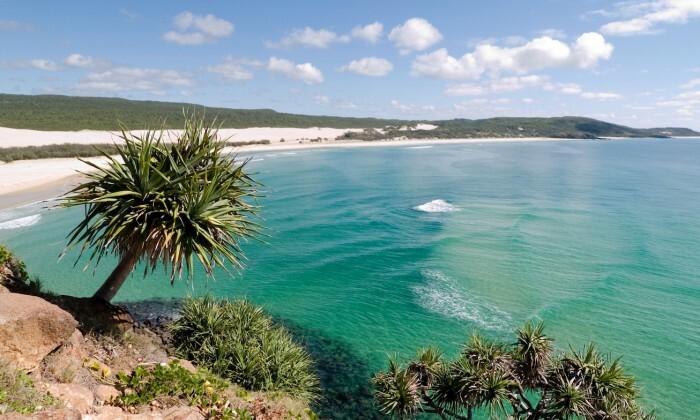 The Fraser Coast’s big attraction is the World Heritage–listed Fraser Island – the largest sand island in the world. The 166,000-hectare island is perfect for a self-drive or guided driving holiday, and offers a range of landscapes to explore. Walk through ancient rainforests (growing out of only sand! ), practice a spot of beach fishing on the eastern side of the island, or swim in some of the 100-plus freshwater lakes, including the picture-perfect Lake McKenzie and the sand dune–bordered Lake Wabby. Back on the mainland (or rather, just off it), you can get up close to the ocean’s gentle giants at the whale-watching capital of the world (according to the locals, at least! ), Hervey Bay. The best time for whale watching is between July and November, as the whales migrate north from cold Antarctic oceans to Australia’s warmer waters. If it’s dolphins that you want to see, head to Tin Can Bay, situated just off the southern tip of Fraser Island. This seaside town is renowned for its visiting wild dolphins, as well as for being a fishing and boating paradise. There’s also a host of hidden gems in the Fraser Coast hinterland, including Kilkivan, Moffatdale, Goomeri and Murgon. These small towns are known for their gourmet local produce, restaurants, eateries and wineries, so if you do take the time to drive west and explore the hinterland, your tastebuds will thank you. Further north, Maryborough is a fascinating historic township where you can soak up the history oozing from its well-preserved colonial streetscapes and architecture. Be sure to take a walk through the original wharf precinct, which now plays host to a range of fantastic restaurants, pubs, museums and art galleries. Maryborough is also the birthplace of Mary Poppins creator Pamela Lyndon Travers, and, aside from visiting the house where she was born, visitors can also explore the town’s striking public artwork that’s based on her novels. Rum-loving travellers will be flocking to Bundaberg to quench their thirst at the Bundaberg Rum Distillery, home of the famous (or infamous, depending on your perspective!) Bundy Rum. You can take a self-guided tour with interactive displays, or for the full experience, get the guided tour and you’ll be shown the processes of fermentation and distillation that go into every bottle of rum produced. For those who prefer a glass of wine over rum, you can happily spend the day tasting locally made wines along the Childers Wine Trail. On top of its four wineries, Childers offers a stunning backdrop of rolling hills, with crops of sugar cane, avocado and macadamia contributing to the robust food production of the region. Bundaberg and Childers are situated at the southern tip of the Great Barrier Reef, so this area is a great jumping-off point for an adventurous trip to one of the world’s greatest natural treasures. Take a daytrip to Lady Elliot Island by scenic flight, and experience some of the best snorkelling and diving in Australia. Known for its unspoilt coral reef and incredible range of marine life, Lady Elliot Island and the surrounding reef ecosystem can be explored from the air, or on the water via a beautiful glass-bottomed boat. Subscribe for more Australian travel stories and destinations!